One of my favorite autumn and winter flavors is orange zest in combination with dried dates or some deep dark chocolate. Or both. It cannot be deep or dark enough. There we go: all sorts of flavored granolas, granola bars, snack bars, cakes and truffles. Notice something? Yes, no cookie recipe yet. 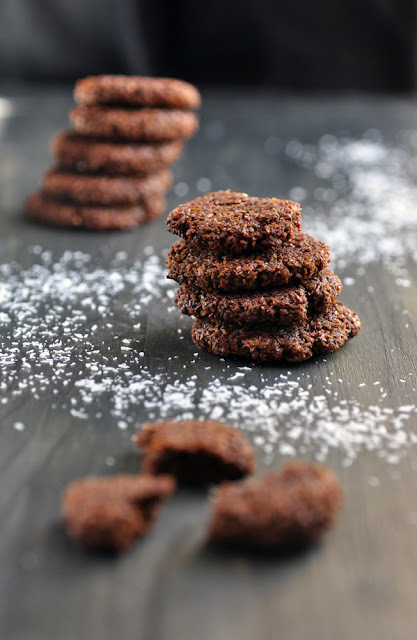 That will change with today's recipe that I am particularly proud of: Grain Free Orange Chocolate Cookies, sweetened with date syrup and honey. First of all: my kids absolutely love them. They are grain free and nut free (so I can pack them into my son's lunch box for school). They can be whipped in no time with very little ingredients that might have sitting in pantry and fridge anyway. I am usually a fan of small amounts when cooking and baking (e.g. who wants to eat the same stuff for days in row...), but these cookies have disappeared so quickly, that it is not necessary halving the recipe. Enjoy! Preheat oven to 180C. Line baking sheet with parchment paper. In a bowl, combine coconut flakes and cocoa powder. Mix well. In another bowl, lightly beat the eggs. Stir in date syrup, honey and orange zest. Combine wet and dry ingredients. Take one tablespoon of the batter and form discs of about 1,5 inches diameter. Place them onto the prepared baking sheet. Bake for 18-20 minutes. Or until golden brown. If you want your cookies slightly more crispy, switch off the oven after 18-20 minutes. Flip the cookies upside down and put back into switched-off but warm oven for another few minutes.